The Vision Centers of Las Vegas | 3D TV - Is It Safe for Your Eyes? 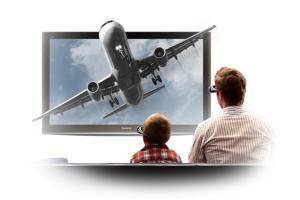 3D TV – Is It Safe for Your Eyes? The 3D Debate: Is Viewing TV in Three Dimensions Bad for Vision? With each new technological development that comes to market, people worry about the long-term side effects of its rise to prominence. Whether it’s the radiation emitted by cellular phones or the 20th-century concerns of parents who feared that too much exposure to television would cause their children to suffer from long-term vision problems, most of these misconceptions have been thoroughly dispelled. Now it’s time to do the same thing regarding 3D television sets and movies. Is 3D a Detriment to Long-Term Vision and Depth Perception? Many people have feared that the quick rise to prominence of 3D entertainment in both theaters and home entertainment rooms has left inadequate time for a study of the long-term effects of this new technology. While it’s always a good idea to be concerned an vigilant, new studies are showing that there really is no reason for concern when it comes to immersive, three-dimensional experiences. In fact, the most severe consequences of watching 3D programming, or playing 3D games for long periods of time, have nothing to do with the eyes themselves. These side effects, which include things like motion sickness and headaches, almost always arise from the way the brain perceives 3D content. After a while, it believes it’s actually part of the landscape and it begins to perceive a small screen as reality. The problem is that the 3D content is surrounded by static, non-moving objects that throw off the brain’s perception. This bit of confusion does cause eyestrain, and it can lead to headaches in many people after extended periods of viewing or gaming. Eyestrain of this nature, however, is not damaging to the eyes and it’s not a cause for long-term concern. Instead, it might be a good idea to simply restrict 3D viewing and gaming to shorter periods, preventing any headaches that might arise. As with all new technologies, moderation will lead to better experiences and fewer side effects. Though 3D viewing won’t produce long-term consequences, no one likes to suffer from a headache after a great movie. By proactively limiting 3D viewing periods, most of these side effects can be eliminated rather easily.